which has good disabled access(*) and closes at 11pm. Please contact us here for any enquiries or to ask us add your name to our email list. We promise that will not bombard you with junk email … just keep you up to date about once/month on our activities. We meet in the Miners’ Club‘s lounge bar – a large, comfortable (but also cheery and COSY!) room that is large enough for most of our concerts and all of our singers’ nights. We will also be able to use the club’s large function room for any larger concerts, apart from the occasional collaboration with our pals in Penicuik Community Arts Association. The only other things you need to know is that there is a good car park and that the door may be locked when you arrive, but a member of the club’s staff will open it very quickly if you ring the wee bell! We are a small-but-perfectly-formed(! 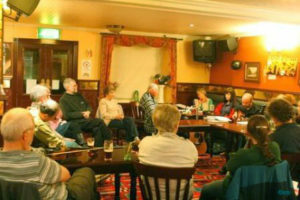 ), broad-minded and friendly folk club. We have a concert once/month (roughly) and a friendly, hosted, songs-and-tunes session on all other Tuesdays (except when that falls on something like Christmas Day). We enjoy and welcome all sorts of music – from big ballads to country classics and from tempestuous tunes to poignant pibrochs. Our “hosted” singing/tune sessions offer a relaxed and supportive evening of listening, joining in, airing your new songs or finding your musical feet. If you want to chat about what we do before trying us out – please contact us using the contact form or ring Alan on 01968 678610. There are other folk clubs run by our friends in the Edinburgh area – for example Edinburgh, Leith , Balerno and Nitten. We try to support rather than compete with one another! We also work with the Penicuik Community Arts Association – a group with broader interests than folk music, but often overlapping with ours. We’ve started work on a fuller set of FOLK LINKS to help you to find other sources of folkish enjoyment in our area!